Photo provided by Scott King. Hatra is a ruined city that can be considered as the symbol of Parthian power which for a long time threatened that of Rome. As centre of the empire, it flourished during the 1st and 2nd centuries BC. It was a fortified city of circular design. 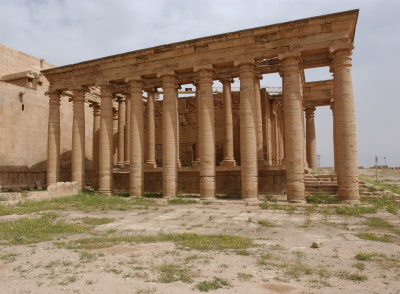 Hatra is located in the Al-Jazirah region of present-day northern Iraq, 180 miles (290 km) northwest of Baghdad. I was a Brigade Intelligence Officer for the 101st Airborne in 2003 and I did a site survey after the "ground war" was over. After coordinating with the caretaker and his family we set up tours for soldiers to view the site. We gave some donations to the family to help them with the tours. The goal was to do more than just guard the site but also to show our soldiers about the historical site. It really is a shame that ISIS has hurt not just the Iraqis but also the world with their destruction. Hatra was a very impressive place. I was there in 2003 with the 101st airborne. There was a unit there securing the site from looters. The man who was the caretqaker there gave us a tour. I remember walking in to the city itself, the plaza was impressive, there was an arena fairly close to an altar to one of the gods I believe. The main building held the throne room, the court room and a temple. For me it was my first trip into something that old. I loved it. Location for a classic movie: Director William Friedkin filmed in Hatra for the first scene in The Exorcist, in which a priest at an archaeology dig unearths an ancient talisman belonging to Pazuzu, an ancient Mesopotamian demon.